Many of us enjoy a great bottle of wine. If you enjoy a couple of glasses of red wine every few days like I do, the habit can get expensive. I used to visit some of the big box stores like Total Wine. I always came out of there spending too much money and a bit overwhelmed by all the choices. I could never remember if that $24 bottle of wine was better than $7.99 bottle of wine or which vintage was the best for that particular brand. I needed a more curated selection of wine and more brands that were reasonably priced. I found my wine mecca at Trader Joe’s. 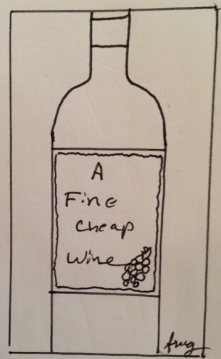 Trader Joe’s has always specialized in inexpensive wines that taste great and are a good value. Their first store in California was famous for its selection of local wines. I’ve picked up some great bottles of wine there, including their house brand Napa River Merlot for under $6.00. Still, not every wine in TJs will meet my taste and frugal budget. I experimented and put a limit of $7 for any bottle of wine I purchase at Trader Joe’s. Not a problem since they have plenty of French and Italian wines, as well as great California reds and whites, many of them in the $5 to $6 price range. So, I narrowed my choices from thousands of bottles of wine at Total Wine to maybe 50 or so at Trader Joe’s. Still too many. I needed something to narrow that selection down and help me find the very best of these cellar dwellers. To assist in my experiment, I found a great app, Vivino. At first, I just thought I needed something that would allow me to look up different wines and save them in the app. Then I came across Vivino. I could literally scan any wine label and instantly pull up the products reviews, global ranking, country ranking, even ranking among that particular winery. For example, I scanned a fancy looking bottle of French wine called “Badet Clement Pontificis 2008.” Instantly I saw that this bottle had a 3.6 of 4 rating in the app, but more importantly, had a high rank in France, had a high rank in it’s region of France, and was the seventh highest ranked bottle from this winery. Lots of glowing reviews from wine snobs who would take the time to write this kind of stuff up. Best of all, it was at a “drop it in your cart and go” price of $5.99. The other interesting thing about this app is that it’s calling on a total database of 693,000 wines so there’s plenty of information to back up a high rating. Once I get home and taste the wine, I make sure that I drop in my own quick star rating so if it’s a dog, I don’t buy it again. Trader Joe’s is pretty loyal to some of these brands so once you find a couple of great ones it’s easy to quickly go in and stock up. Another trick I found to make a $5.99 bottle of red wine taste like a more sought-after vintage is to properly aerate before drinking. There are lots of quick easy ways to do this. You can also check out the mad scientist Tim Ferriss’ method for hyper decanting wine here. So, open up that great bottle of cheap wine, aerate it, and sit back and enjoy the fruits of your search for the perfect bottle of cheap wine. No Trader Joe’s in your area? Use the app to sniff out some decent buys at your local supermarket. My current wine selections at Trader Joe’s.